“Two-thirds of college seniors who graduated in 2011 had student loan debt, with an average of $26,600 per borrower,” reports the Project on Student Debt organization. Have kids that you want to send to college? Then you likely have anxiety about how you will pay for it! There is one thing you know will help: SAVE. Earlier is better thanks to compound interest. But the next steps can be less clear. We can help! Coverdell Education Savings Account (ESA): An ESA grows tax free. Invest post-tax money (just regular money from your paycheck) and interest is earned. When the money is withdrawn for qualified education expenses it is not taxed; thus the interest earned in the account is never taxed. Only $2000 a year may be contributed per child, if you make less than $200,000. You may open an ESA for anyone under 18. The money must be used up or transferred to another family member by the time the person is 30. It can be used to pay for tuition and fees, required books, supplies and equipment and qualified expenses for room and board. It can be used to pay for expenses for any public, private, or religious elementary and secondary schools, as well as any post-secondary, college, university or vocational training institution. It can only be used to pay for expenses for post-secondary, college, university, and vocational training. Each state offers their own 529 plan, but you can buy from any state you want! The benefit to buying in your own state is that the contributions are usually tax deductible on your state taxes. 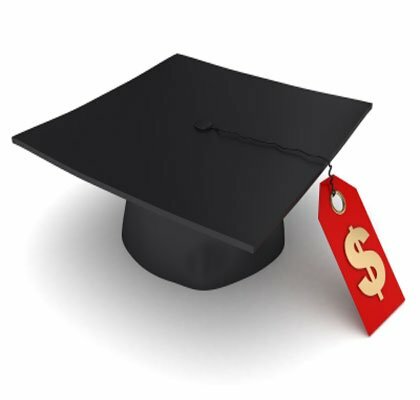 See here and here for some current rankings of different 529 plans. We generally encourage people not to use education insurance plans, prepaid tuition plans, or savings bonds to save for future college expenses. If you’re like me, options that need little to no money but instead require an investment of time and research are becoming increasingly attractive! Apply for scholarships! Many go unclaimed every year. Get on a scholarship emailing list. If you qualify, apply for federal educational aid. Use your networks to get your child good job experience while they’re still at home! This can, among other things, enable them to earn a higher wage while at college. Investigate the option of getting college credit and fulfilling high school requirements at the same time! Many community colleges offer this option as well as some AP classes in high school. Finish in 4 years! Help your child research beforehand what they would like to study to avoid wasted time. Do your homework! Consider all options: cost of living in a particular city, the percent of students placed in jobs at the other end of school, marketability of majors, online courses. Get creative! Remember that not every dollar thrown at education will automatically come back, just like we all learned in the housing bubble that not every dollar we threw at our houses came back. See these 2012 “college best buy” lists by the Center for College Affordability & Productivity and Forbes.